More Snyder! Are you excited? I am. This is NOT one of the study books. It takes place in the same world, but 5 years after Fire Study and with a different main character. That being said, it is not necessary to have read the Study books before reading the glass books, however, I highly recommend it. In this story we follow Opal (who's back story I will not divulge, as it contains great spoilers to the Study books), and her quest for magic, love, and adventure. Stormdancers are dying, and there isn't enough power to power to run the factories of Sitia. They determine that there's a problem with the glass orbs the storms are being stored it. Opal is Sitia's glass expert, so she's sent to fix the problem. However, there are plenty of people standing in her way, not all of them enemies. I enjoyed this book, not as much as the Study books, but I think it's just because I missed Yelena(she's hardly in this at all). I thought the story was gripping, and the world believable. This book had one of my biggest pet peeves, two love interests that you liked. Grr! I hate that! Because then no matter who she chooses, you're going to be disappointed. Plus, TOTAL cliffhanger at the end in regards to one of the love interests. I'm glad I have the sequel Sea Glass on hand. Thanks for the review. I will definately pick this one up. BTW Have you read the house of night Series by PC & Kristin Cast? If so what were your thoughts. I recently read Poison Study, and I loved Yelena. She was a great character. I would probabaly agree with you on the age restriction too. 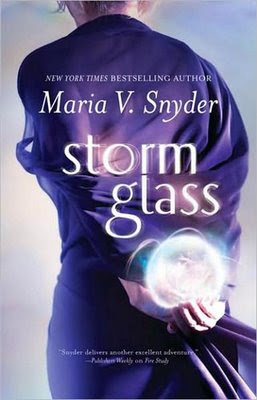 It looks like I have a lot of books to read BEFORE I even get close to "Storm Glass." The story sounds intriguing. I haven't read that series, but it sounds familiar. Do you recommend it? Yes I do recommend it. I loved it. Basically its a vampire story of a girl from the mid-west US and how you are marked to become a vampire, not bitten and youhave to go through a change to become a vamp. The House of Night is their school..sometimes described as vampire prep school. The first book is Marked and book 5 is being released at the end of the month.